The first product is Whipped Body Velvet - the name alone makes me want to smother my body in this product! It contains shea butter, which is an ingredient that I cannot put near my face but for some reason, my body is completely fine with it. It also contains a number of other oils and butters - coconut, avocado, almond and rarabe, to name just a few and they all combine to make an intensely nourishing body moisturiser. A tiny amount goes a very long way with this - it has an almost mousse-like texture, which turns into an oil when massaged into the skin, making it go further. This is intensely moisturising on the skin and I think it's better suited to night-time after a bath or shower, because it takes a while to fully absorb into the skin. That being said, there is nothing nicer than applying this and then putting on fresh pyjamas, knowing that you will wake up with soft skin. It has a beautiful, warm vanilla scent, which I also find very comforting so, for me, it's the perfect evening treat! The second product that I was sent is Super Greens Nutrient Boost Serum, which is described as a shot of healthy greens for the skin. This is packed full of skin-loving ingredients - Squalane, Vitamin E, Avocado Oil and Coconut Oil to name just a few. Because I was testing a different serum as part of my morning skincare routine, I used this primarily at night. It has a pipette dispenser, which I personally love as I can control how much I dispense and it prevents waste. It's green in colour, but don't worry, you won't end up looking ill because it disappears when applied to the skin.It is very lightweight in texture and I must admit that it smells a little funky, but I don't really mind because it dissipates after a few minutes. I have been applying a few drops of this nightly and then I leave it to fully absorb for around a minute before proceeding with my other products. I have found that this really helped with soothing inflammation in my skin - my areas of redness are toned down and overall, my skin is calmer and more comfortable. I also noticed that it helps to quench my skin's thirst as it doesn't feel as taut in the mornings. 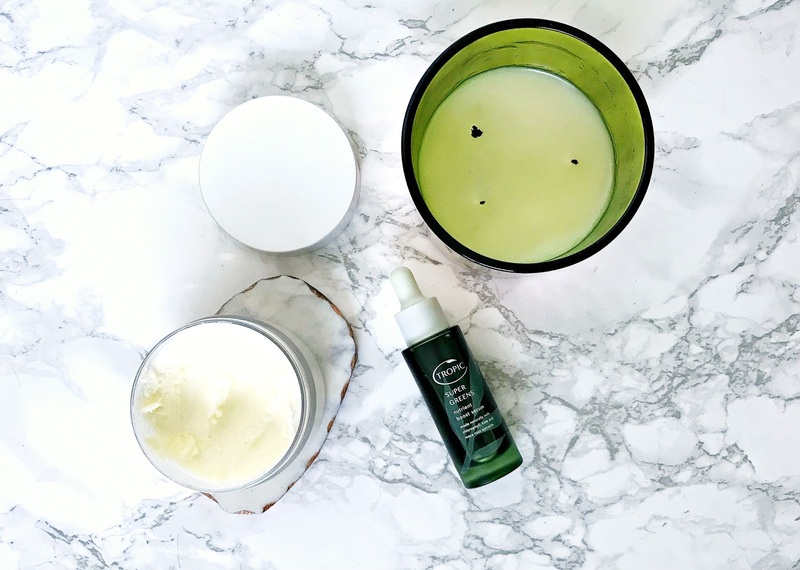 Overall, I am really impressed, so if you are looking for a new serum and green beauty is a priority for you, I would highly recommend trying this! Have you tried any Tropic products? Is green beauty a priority for you? I'd love to hear! All products are bought by me, unless otherwise stated. I was kindly sent these products. Opinion is always my own.